In late October, two Illinois mail carriers helped to rescue a kitten which was stuck in a storm drain. In late October, two Illinois mail carriers helped to rescue a kitten which was stuck in a storm drain. Today, that kitten is recovering well and will be available for adoption soon. 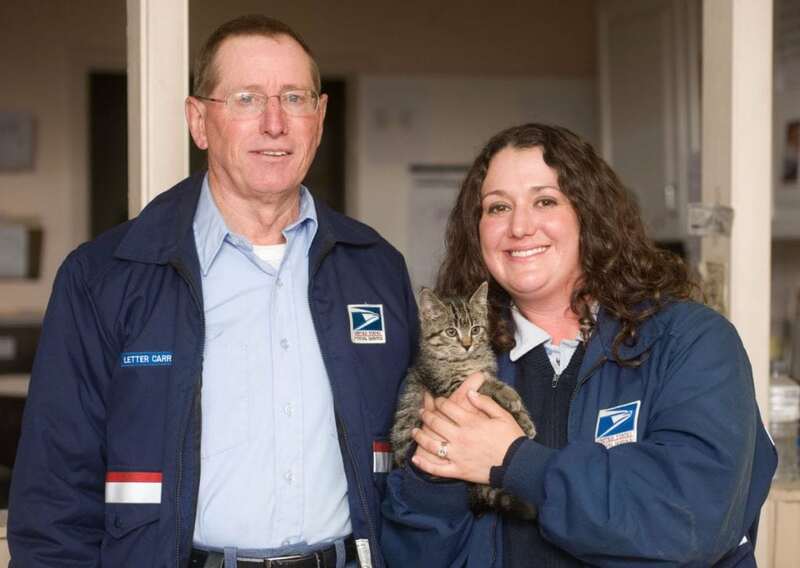 Mail carrier Larry Hudson first heard a kitten crying near a storm drain on October 31st. He told his colleague and animal lover, Gemma Sciuto-Alverson, that the residents had heard the kitten crying for a few days, but a utility crew sent to rescue the animal hadn’t been able to locate it. Sciuto-Alverson immediately got Hudson to go back to the drain with her, where they both heard the kitten crying. Local residents brought out a crow bar and managed to pry the grate off of the drain. Sciuto-Alverson was then lowered down into the drain, a distance of about 8 to 10 feet. She found the kitten wedged back between some pipes and carried him to safety. Since his rescue, the kitten has been fostered by Brenda Hall, an employee of the Coles County Animal Shelter. The kitten has put on weight and is doing well. Thanks to the teamwork of the mail carriers and the residents, this kitten is now safe and will soon be up for adoption so that he can find a forever family of his own.